When only a giant zucchini will do: to make zucchini noodles. Zoodles some call them. Use them the same way you use pasta. They taste great, and they are gluten free, wheat free and carb free. Also you don’t need to think about what vegetable to serve. They are the “something green” in your meal. Here are two kinds of zucchini noodles I have made, using two blade plates of a mandoline slicer. For thin ones, use the mincer (the one with close-set cutting teeth). For thick fettucine size noodles, use the cutting or julienne blade (with teeth about ¼ inch apart). Cut the zucchini in half lengthwise. If it’s wider than the base of your slicer, cut in half lengthwise again so that it will fit. One half a giant zucchini (say 12″/30 cm) makes enough noodles for two servings. Then, carefully, slide the zucchini the full length of the slicer. Keep it as flat as you can. Continue this, turning the zucchini around as needed to keep making nice long noodle strings. Stop when you reach the inner part. The seedy, soft part middle will not slice well. 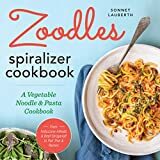 You can sauté, microwave or boil the zoodles. I heated a tbsp or so of olive oil in a pan and sautéed them a few minutes. Stir and flip them often. Water will come out of the zucchini. That’s good. After another couple minutes, your pile of noodles will shrink in size and they will look cooked. And they are. Put noodles on plates, draining as much water off as you can. Add your topping. I used alfredo sauce, microwaved straight from the jar. Enjoy. Using a mandoline is quite labour intensive. Your arm gets tired. So if you are making dinner for eight, even four, you might want a method that is easier and faster. Maybe that’s where a spiralizer or some specialized tool would be worthwhile. See Downshiftology for much more information on zucchini noodle making.